Ach! du meine gute! La dolce musica. Cecilia is doing Anita Ekberg in the Trevi Fountain. Well, I have already thrown my coins. This sounds really, really good. Are we to believe this album is x rated? What fun. I was needing cheering up. This refers to Cecilia Bartoli's new album Opera Proibita. 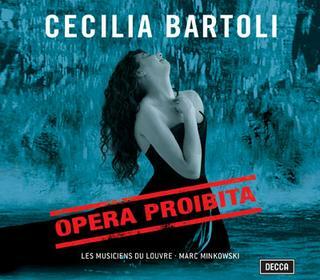 I could never have seen in my wildest imagination the direction Cecilia Bartoli's career has taken. I wrote about the missing Italians in previous blogs, the men who invented opera but whose works are seldom heard. High on this list are Caldara and Alessandro Scarlatti, two of the featured composers on her up-coming album. She is altering the landscape of music. I admire her deeply. Oh, yes. Cecilia is definitely in a groove these days, looking and sounding fabulous.